I'm not usually one for grabbing whatever shiny new thing I see. But the pictures I've seen of this particular polish made me want them badly. However, I'm in a bit of a polish desert when it comes to new stuff...and I gave up any hope of finding them. Imagine my surprise when I stumbled across a completely full display at my local Target! I wanted to grab them all, but instead settled on one color: Leaden Lilac. I chose this one because it's something different, for me at least. I don't normally gravitate towards purples, but in person this one is a near perfect periwinkle-lilac shade which I definitely don't have much of in my collection. The only other polish I have like this is Push and Shove, from the Gwen Stefani for OPI collection. This has a very similar finish. It also has the same caution against applying top coat. I wish it had come with some sort of base, because I hate applying polish to my bare nails. You can see every groove and line, and it makes me mad. The main difference between this and Push and Shove is the formula. Push and Shove applies smoothly and easily, whereas this one has a weird...plasticky feel to it. And god-forbid you don't shake the hell out of this stuff...the pigments need to be well mixed, otherwise you get a weird collection of streaks in the color. I also had a little bubbling here and there, but it wasn't terrible. I think this formula feels so strange is because it tries to self-level a bit, when really I wish it wouldn't bother. Push and Shove cautions against wearing this for too long, as it is a "one night engagement" sort of polish. I have had this polish on for six days, and the wear isn't terrible. No big chips, and it is just starting to wear away on the actual nail. That pleases me, because even though I don't wear polishes for this long often...I do like having the option to do so. Troubles aside, I am definitely considering picking up a few more of these. I want all the shiny things. 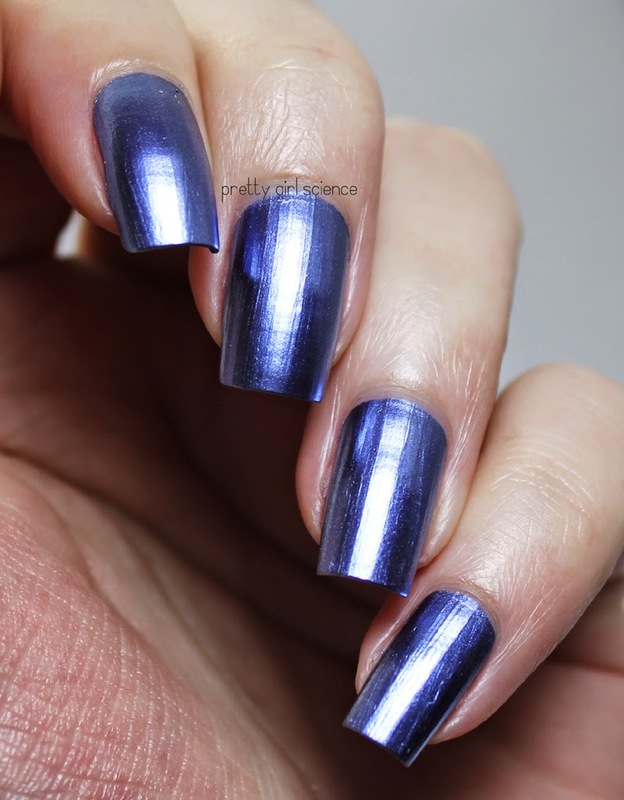 This is such a gorgeous polish! I love the finish and the colour too, and it's great that it stays on longer than Push & Shove! I ended up wearing it for a few days longer. Once if starts to fail, it is catastrophic. It doesn't really chip, but kind wears off. It's weird, but it gives me ideas. Ouu so pretty! I wonder if they're good for stamping? hmmm.. I dunno. I imagine this one would be. They are pretty opaque. I will have to investigate! I'm wearing mine now! I originally only picked up the blue and green, but bought the silver this weekend at Walgreens. I love them so much. The formulas are dreadful - you're dead on about that. But the longevity sort of compensates. And I've worn them a few ways already: over bare nails (streaky and patchy), over an existing mani (much smoother but still a bit patchy on the first coat, and currently, with a holo top coat. oooh, I wonder how they do with a holo top coat? I love this line. And when not mixed properly, I kinda dig the tie dye kinda effect. If done intentionally. I do too! The superstreaks aren't great for regular swatches, but I think they could look really neat...almost like a watermarble in a bottle. Yup. I got the Blue one & I loved it. I had never used a polish like this, given that I'm new in this, but I see myself wearing more. Looks great!!! Would love to try them! target had them for around $5 when I was there last. Ooh your lucky! My target has them for $7.99! Have you tried it over a base of seche vite? I have not tried it over any base yet. I want to try it over Gelous, and the base that came with Push and Shove. The Polished Mommy says that they work well over any glossy base coat though.